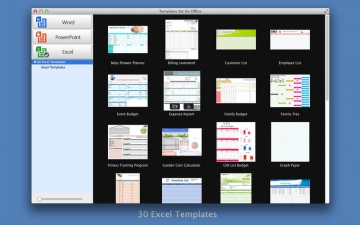 [値下げ] Templates Set for Office | Mac App Storeのアプリ検索・ランキング BuzzMac! 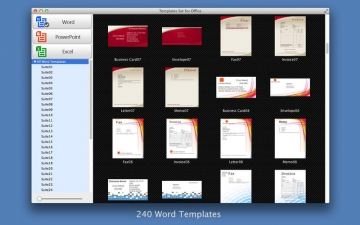 Templates Set for Office is an impressive collection of templates for Microsoft Office users. 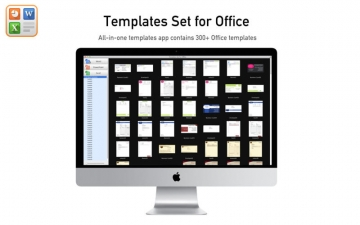 This all-in-one templates suite app contains 300+ Office templates to let you effortlessly make Word document, PowerPoint presentation or Excel Spreadsheet. * 240 suites Word templates present your business, with each sets including Business Card, Envelope, Fax, Invoice, Letter and Memo templates, . All the Word templates are designed in specific and professional-look theme, with simple layouts and marvelous elements and amazing fonts, which can be revised or redesigned as your wish. * 40 PowerPoint templates with different themes, beautiful backgrounds, unique layouts and matched fonts, can be used in kinds of situations, no matter what industry you are working in, you can find one template meets your need. * 32 Excel templates cover many categories, from invoice, report, budget, list, planner, and more. All these Excel templates are made for both business and personal use. Most of the Office templates are available in international standard A4 and US letter sizes, such as Word and Excel templates. 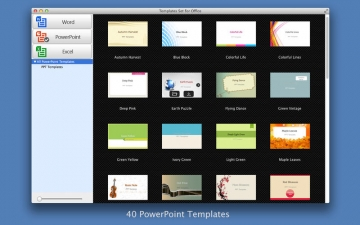 And all PowerPoint templates are in 16:10, which is a popular widescreen size to demonstrate your contents.